Well, after trying this month's bread challenge from the BBB, I had to go out and get a copy of the cookbook! And I was lucky to find a great condition hardbound copy of The Village Baker by Joe Ortiz for pretty cheap. I did have to tweak the ingredients just a bit because my daughter is allergic to soy, but that was an easy substitution for this wonderful recipe. It's an easy dough that produces a delightfully crunchy and complex, yet not too heavy loaf. 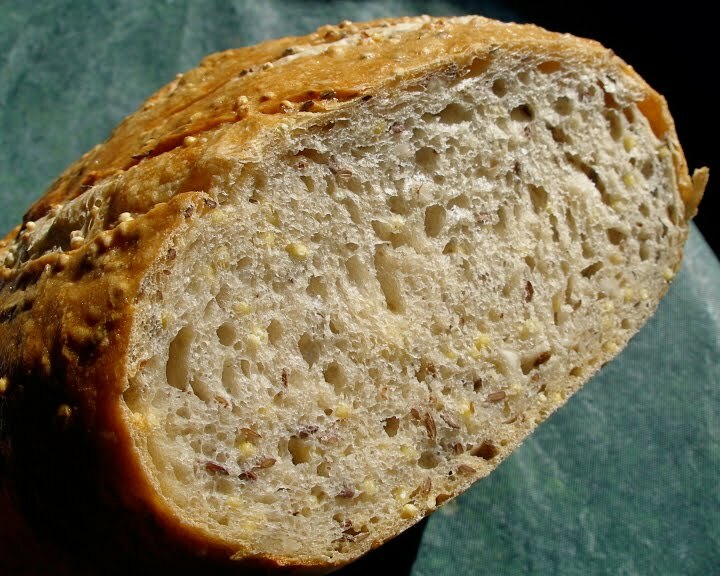 (What I would have disdained as the "birdseed bread" that my mother loved when I was growing up.) 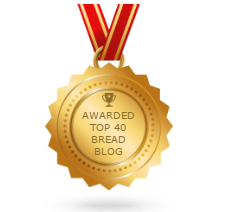 I suppose with her good example it is not surprising that I learned to appreciate and prize loaves like that. If you wish to try the original recipe with the soy nuts, check out the original post at Notitie van Lien. I used chopped Crispy Almonds instead and it turned out fabulous. I wanted a high protein nut with good texture to approximate the protein and texture of the soy nuts. Almonds were the way to go. You can make them yourself or you might find them at the healthfood store as "Sprouted Almonds". I'm sure toasted almonds would work just as well too. Update: Once again, found out that this qualifies for BBD #31, "Breads with Nuts" Cool! First proof the yeast, in a large bowl, in 1 cup of the warm water. (I use instant yeast which does not require proofing). When it is creamy, mix in 1½ cups warm water and slowly add the rye flour, whole wheat flour, and 1½ cups of white flour by handfuls while stirring the mixture with a wooden spoon. Set the batter aside, in a large bowl, covered with a dish towel, for between 8 and 10 hours or overnight. Proof the yeast in the warm water, add it to the risen sponge, and mix the two together. Start adding the flour, handful by handful, stirring vigorously with a wooden spoon. After all but 1 cup of the flour has been added (this will take about 10 minutes), turn the dough out onto your worktable, sprinkle the salt and the ground caraway over the dough, and incorporate them by kneading the dough for about 5 minutes while adding the last of the flour. The dough should be very moist. 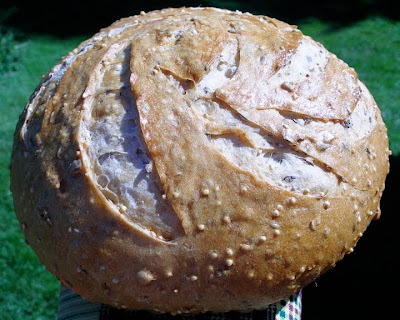 Add the flax seeds, millet, and roasted soy beans crispy almonds and knead the dough to incorporate them. 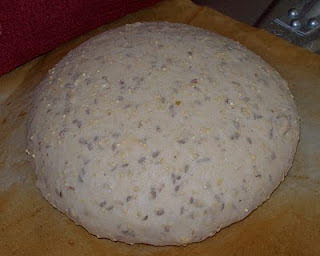 Set the dough aside, covered, to rise for 1 hour, until it has doubled in size. 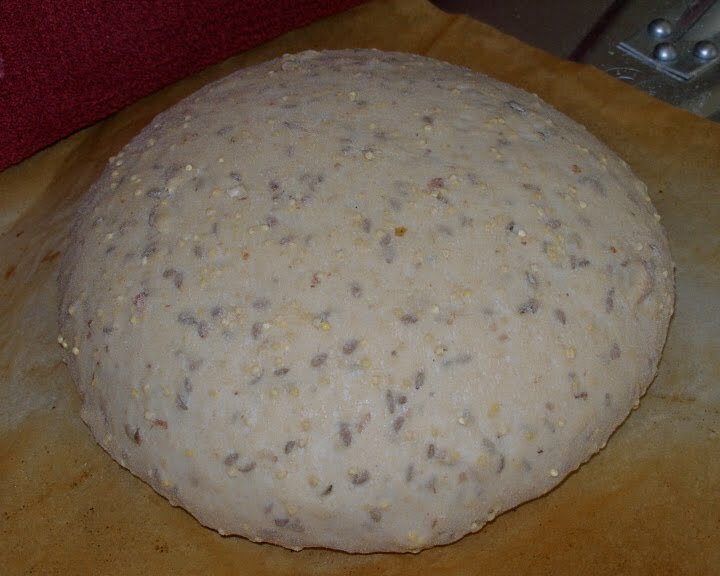 Flatten out the dough again and then shape it into a round loaf. 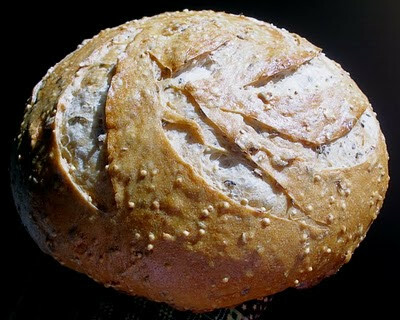 This loaf is best proofed in a canvas-lined basket and then baked on a baking stone in the oven. It can also be placed on a parchment-lined baking sheet. Let the loaf rise for about 1 1/2 hours. Glaze the loaf with the egg and milk mixture and bake it in a preheated 425°F oven for between 30 and 35 minutes. I've got to admit that though I'm normally too uh, well... lazy to deal with a glaze, I took the time with this loaf and it does produce beautiful results. I'll send this one over to Susan for YeastSpotting. I just love it when people twist the recipe, this gives some great ideas! Love that almond crisp in it, sounds just delicious. Your loafe looks beautiful. Glad you liked it. 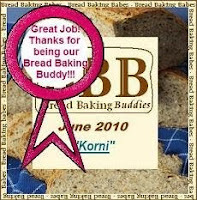 Thanks for baking with us!!! Mmmmm, this made a fabulous grilled cheese sandwich with cheddar and Boursin! Now that's a great idea with the almonds as a substitute! Lovely loaf and great slashes as well! Beautiful! Crispy almonds sound delicious. And how lucky to find the book!!! I can only find it for 50-200 here for used.. plus s+h and duty of course! One day.. Thanks so much for baking with us again! Good gracious! Now I feel guilty for finding it for $15! And there's a glut of them on amazon too, it's almost a crime. Great substitution using the sprouted almonds instead of the soy. Your loaf is gorgeous! Well done. Thank you for participating in BBD #31. The Variation with almonds sounds delicious! You scored twice with this one: great book, great bread. Birdseed, yes you're right & I probably would have been hard pressed to try this years ago. Lucky we grow up. Lucky is right, what a great resource there is in this book! I'm loving it already. Everyone keep your eyes peeled for it; definitely a good one to have.